Alesis Recital Review - Is It Worth The Investment? 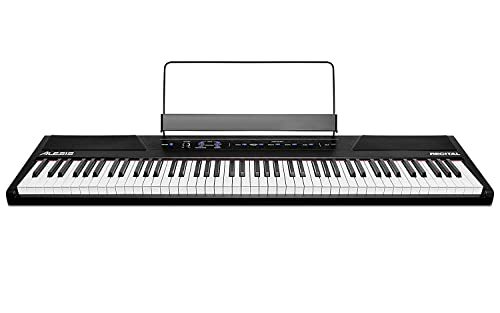 Alesis is known for their ground-breaking studio equipment and electronic instruments, so it is no wonder that the Alesis Recital is a great digital piano. The Alesis Recital is one of three digital pianos made by the company. While it is not as sophisticated at the Recital Pro and Coda Pro, the Recital has the advantage of being designed for amateurs as well as experts. In addition to the other digital pianos, the Alesis Recital joins a varied product line of drums, percussion, recording, and live sound equipment. Want to know if the Alesis Recital is really all it’s cracked up to be? Read on . 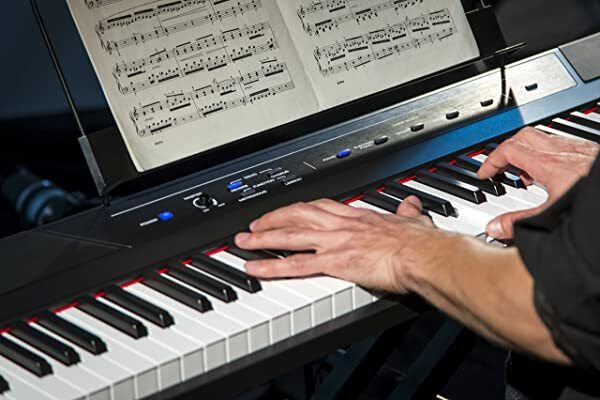 . .
As always, know the specifics about a digital piano before you purchase it. This will save you time and heartbreak in the long run by preventing you from buying the wrong instrument. The most important specifics for the Alesis recital follow. Another way to decide if a digital piano will work for you is by examining the top features of the product. In the case of the Alesis Recital, there are a number of features to consider. But, don’t take our word for it . . .
Alesis is committed to teaching the piano as well as selling products. Therefore, they have included a number of educational features with their Recital. Most importantly, you can choose between the standard, split, layer, and lesson modes. Most of these modes are standard on many digital pianos. But, the lesson mode adds a new element to the Alesis Recital. The lesson mode divides the Recital’s keyboard into two areas. Each of these areas has the same pitch and voice. This allows a teacher and student to play the same notes at the same time; facilitating learning. Additionally, the Alesis Recital includes a three-month subscription to Skoove. 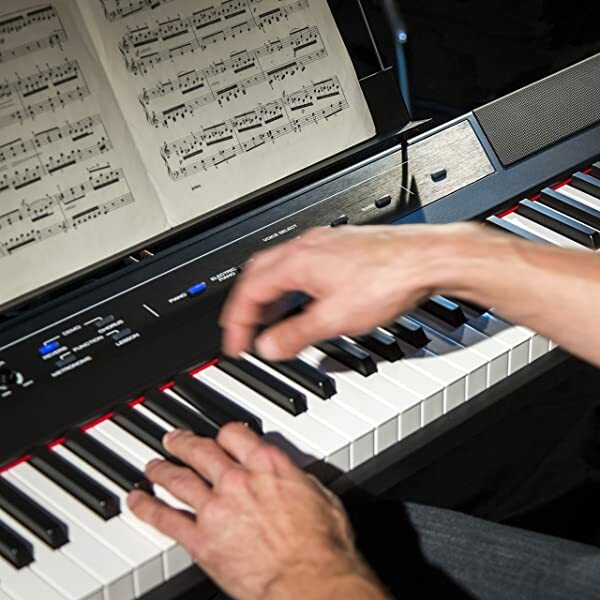 Skoove is a service that provides interactive online piano lessons. After the three-month trial, you can choose to continue your membership or cancel it. Now you don’t even need a teacher. The Alesis Recital teaches you to sound like a professional. If you want a digital piano with a lot of connectivity, then the Alesis Recital is the product for you. It comes with a number of inputs and outputs. These include a ¼ inch sustain pedal input, ¼ inch stereo headphone output, and stereo RCA outputs. Each of these connectivity features provides important benefits to you, the player. Attaching a sustain pedal makes the Alesis Recital play like an acoustic piano. It also allows you to work on that all-important pedal technique. The headphone output allows you to practice as much as you want without bothering anyone. Finally, the RCA outputs mean that you can connect a recorder, mixer, amplifier, or other sound system of your choice. You will find the keyboard listed as one of the top features in many of our digital piano reviews (such as here and here). We include this feature so often because it is essential to a well-constructed digital piano. And the Alesis Recital is no different. Alesis’ Recital comes with a full-sized keyboard of eighty-eight keys. The keys are all semi-weighted and the same length and width of those on an acoustic piano. Plus, this style of key design requires a much lighter touch than a fully weighted keyboard. So, with this key configuration, Alesis has designed a keyboard that will conform to lighting playing styles. The semi-weighted nature of the keys is the one drawback to the keyboard on the Alesis Recital. Check out the fully weighted or graded weighted keys like those on the Yamaha YDP 103 for another type of keyboard. The light weight keys of the Alesis Recital are perfect for beginners or children. However, they may be distracting for the experienced player. Still on the fence? Consider these pros and cons. The Alesis Recital comes with 128 note max polyphony. This means that the number of pitches that can be played at one time is 128. 128 max polyphony is a very good, but not industry-leading number. However, it should be more than enough for all but the most advanced players. Alesis’ Recital is an extremely affordable digital piano. This makes it even more perfect for a beginning player. Try this digital keyboard out, and see if you like it before taking the plunge and purchasing a digital piano for under $1000. You will get a built-in metronome with the Alesis Recital. The metronome is not as fancy as the ones found on Korg’s digital pianos. But it is still very good. It will click from 30 BPM (beats per minute) to 280 BPMs. This is more than enough tempi for any player. The Alesis Recital does not come with a stand for the keyboard. You do get a music stand with your purchase. But, if you want to sit at the keyboard like you would a traditional instrument, you will have to purchase a stand separately. There are no pre-recorded songs on the Alesis Recital. And, there are only five built-in voices to choose from. If you are looking for an instrument with many different options, then this is not the right product for you. The Alesis Recital is a great beginner digital piano. No matter why you are making this purchase, Alesis gives you the tools to succeed. There are many features to love on the Alesis Recital. You get an easy-to-play keyboard and the included three-month trial subscription to Skoove. Plus, there is the high amount of polyphony. This instrument has a lot of amazing features and specifications. Therefore, it is clear that the Alesis Recital is a winner. However, if you are an advanced player or are coming from an acoustic piano, you may want to find another product. 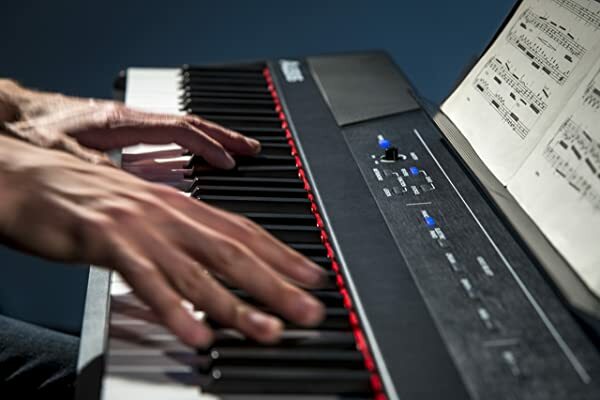 The Alesis Recital provides everything that an affordable digital piano can offer. But, it is not—and isn’t trying to be—an acoustic piano. This can make it hard to transition between the two. Still, the Alesis Recital is a great choice if you are looking for a digital keyboard. Try one today.